If you want to work, spend more time with your family, or have other obligations or interests - home dialysis allows you to arrange your dialysis treatments around your work schedule or other requirements. 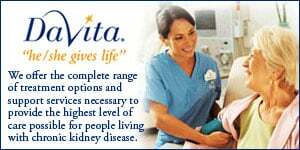 Home dialysis also saves time because you don't have to drive back and forth to a dialysis center three days a week. For those who depend on family or friends to help them with transportation or live far from the nearest dialysis facility, this can be a big advantage. Performing dialysis treatments at home also provides an opportunity for you to learn more about your medical condition and take more responsibility for your care. Your involvement in your health care can empower you to influence the quality of your life each and every day. Research has shown that patients who perform dialysis at home may experience better quality of life and better clinical results - especially those who take advantage of their home setting to have more frequent or extended dialysis. Many patients even choose to dialyze at night while they sleep, getting the benefits of extended dialysis without losing time with family and friends. Clinical references available upon request.